Cynics and snarkazoids unite in praise of the great Warren Zevon. In all of music, there are few composers more daring with lyrics and themes. Mr. Z was a bit outlandish, at times. "Dark" and dismal worked for him, but he was not limited to that - no sirree! Warren's musical talents spread far and wide. Is there a musical symbol for tongue-in-cheek or smug? There should be - and if life is fair, that symbol is called a Zevon. Warren was born in 1947 in Chicago, Illinois. His Russian Jewish immigrant father loved to gamble and it's been said that he handled the dice games for mobster Mickey Cohen. Warren's mother was a Mormon of English descent who, by all accounts, was devoted to her family. They moved to Fresno, California, when Warren was a child. His musical talents would evolve early on; soon he was studying piano and guitar. Igor Stravinsky (yes...THAT Igor Stravinsky) invited young Warren to him home occasionally to study modern classical music. The boy was serious about music and chose it as a career when he was just hitting puberty. By the time he hit 16, he left California for New York to be a singer. Zevon honed his craft in New York and released his first albums. A song called "Follow Me" made it to #65 on the Billboard charts in 1966, but I have to confess that his first albums came and went without being noticed by yours truly. In the early 70s, he toured with the Everly Brothers as a pianist before the brothers duked it up and went their separate ways. A few years later, I started to take notice of songs by a certain "Warren Zevon" that were recorded by other musicians, like "Poor, Poor Pitiful Me" by Linda Ronstadt. With the release of Excitable Boy in 1978, Zevon had arrived for the masses. That album produced the classic "Werewolves of London." If you want a laugh, google Zevon's full discography, if only to read the titles, which include: Bad Luck Steak in Dancing School, Sentimental Hygiene, Mr. Bad Example, Learning the Flinch, and My Ride's Here. Like most of the musicians I've addressed in the A-to-Z, he remained prolific and collaborated with the best the business; I've even seen him as band leader on Late Show with David Letterman when Paul Shaffer was away. In the Fall of 2002, Warren was suffering a chronic cough and frequently felt lightheaded. A fear of doctors had kept him away from regular check ups and maintenance. Soon pain and shortness of breath sent him to the doctor. The prognosis was grim: he had cancer of the abdominal lining. The doctors held out little hope that he would live more than a few months. Rather than submit to the debilitating (and rarely successful) treatment, Warren went to work on his last album. The Wind was released in August of 2003 and reached #12 on the US charts. As much as I loved the early stuff, this last album blew me away. If you only get one Warren Zevon album, get The Wind. Posthumously, it received five Grammy nominations and won two: Best Contemporary Folk Album and Best Rock Performance by a Duo or Group for his duet with The Boss, Bruce Springsteen, "Disorder in the House." A documentary about the making of The Wind is a gem. [Link] Fellow musicians surround him and it's apparent that he is still a force of nature, in spite of the obvious deterioration and debilitation as the disease takes it's toll on the man. Mixed emotions get dredged up when I watch it; all that sadness is wrapped in beautiful music as Warren Zevon does what he loved to do most, one last time. Proving the doctors wrong must have given his pleasure; he lasted longer than "a few months" - he hung on for a year. Warren died in his home on September 7, 2003. "Keep Me in Your Heart"
Werewolves of London. The only one that rang a bell for me. I think that rings a bell for everyone. Thanks, Mike! Warren goes to the 'Burrito King' at the corner of Sunset Boulevard and Alvarado in Los Angeles, and... [Click da Link:->] WARREN RECOMMENDS THE "MACHACA BURRITO"; I SAY, "CHILE RELLENO BURRITO" - LET'S CALL THE WHOLE THING OFF! Have you ever been to the 'Burrito King' at the corner of "Sunset and Alvarado" in L.A.? I have. I've been there with friends. Being a vegetarian, I always ordered the 'Chile Relleno Burrito'... BUT(t)... my friends - the meat-eaters - always ordered the 'Machaca Burrito'. ...Believe me, I KNOW what causes the "gusty winds around the corner of Sunset and Alvarado", and it AIN'T the 'Chile Relleno Burrito'! I have never been to the Burrito King or the corner of Sunset and Alvarado, but I'd eat either food item and pray it didn't give me flaming gut bomb. How can one not love Keep Me in Your Heart? Art thou skirting the issue? (Methinks you'd only like the early stuff and see the last album as pandering...to what, I'm not sure - the masses? The estate lawyers? Heirs? Grammy gurus?). I've got a date with Tylenol and java; every allergen known to man is forming a cloud over my field, just so I can partake of it's evil. I am crushed; I am crestfallen; I am coagulated like cottage cheese, crammed into a Jello mold and shot from a cannon clear to Chicaganada on a cold October night. Pulling together all my insider knowledge of song lyrics and street corners and fast food joints, with links and funny stuffs, and Warren improvising in a Zevony way, I post what I feel is perhaps the best comment I've ever left... ANYWHERE. (In fact, I even had to recreate the entire thing from scratch because the first masterpiece was destroyed in a "screen freeze/computer shutdown". Ooh! The words I used right out loud! Well, the show must go on, so I shall return (after imbibing Warren Zevon's favorite cocktail: a quart of Vodka) and submit a new, more mainstream comment. It won't be funny, but it will mention some ZEVON ZONGS that are particularly meaningful for me. Oh, well, can't always knock the ball outta the park with the first swing. Sometimes the director must yell, "Cut! ...Take Two!" See, I'm a chick...I get the tie-ins, but I'm just looking for validation of Keep Me in Your Heart, ha ha ha. 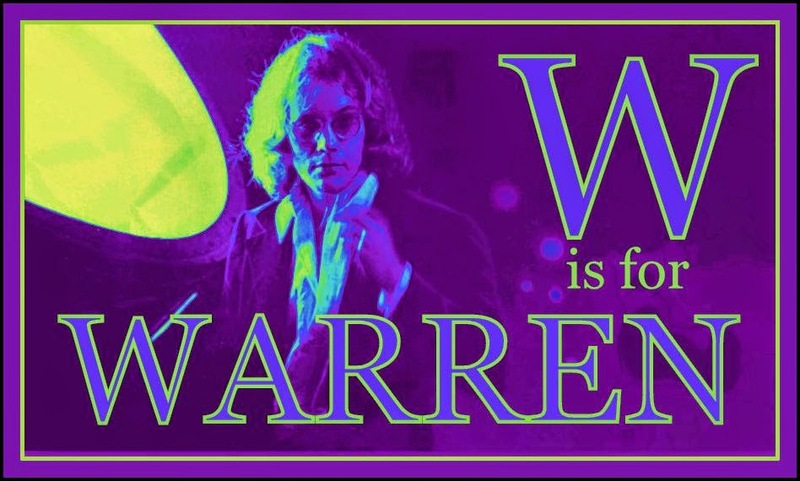 Warren Zevon is one of my favorites. He had that twisted sense of humor that all us sickos can appreciate. And, yes, I do like 'Keep Me In Your Heart', although it wouldn't make my Top 20 Favorite Zevon Zongs list. It's maybe a bit too straight and "on-the-nose" to be a huge favorite of mine. I think Dylan's 'It's Alright, Ma (I'm Only Bleeding)' has the most amazing song lyrics ever penned. Just the rhyming scheme alone is astounding. I credit Dylan (and especially his album 'Bringing It All Back Home') for opening up my mind, creatively. Much of my ability to "think outside-the-box" and utilize wordplay stems from the godzillion times I listened to THAT album when I was in my late teens and very early twenties. But I think the overall greatest song lyricist was (the early, pre-1983) Tom Waits, who himself was highly influenced (as was EVERYONE ELSE) by Dylan. Then there's early Todd Snider, and those are the Big 3. In my op, the next level of greatest lyricists includes early Springsteen, Paul Simon, Jim Croce, Rickie Lee Jones, and our pal, Warren. In fact, I think Zevon could probably lay claim to having written the single greatest line of lyric ever penned: Link:-> "THERE'S A SADNESS IN THE HEART OF THINGS". How many times have I quoted that? Along with some other great Zevonisms like "I'll sleep when I'm dead", "It ain't that pretty at all! ", and "I don't want to talk about it" (the hysterically great twist at the end of the ONLY version of 'Poor, Poor, Pitiful Me' that matters). If I could keep only one Warren album though, it would have to be the debut - it just contains too many songs that I can identify with: 'Mama Couldn't Be Persuaded' (that's my Ma and Pa in that song! ), 'Carmelita' (too deep to even yak 'bout), and 'Desperados Under The Eaves', which to this day must still be my favorite Zevon Zong. That's like a personal ANTHEM! I used to have a fun blog titled [Link:->] Stephen T. McCarthy's STUFFS. That was easily my most popular blog... which, of course, is the reason I HAD TO close it down. But the last song I posted on it was Zevon's 'The Heartache'. The second Z-man was Zevon. The first Z-man was Robert Allen Zimmerman. Do you know my friend FarAwayEyes? (Blog: Far Away Series). She once sent me a CD copy of Zevon's album [Link:->] MUTINEER because she said the title song always makes her think of me. I can't even imagine how that would make her think of me, but... there it is. That song IS perfect for you, I have to agree - and yes, I've been to Far Away Eyes. I need to check and see if I follow it, but I know I've been there. Lyricists are the brains of the song. I love each one of these guys you mentioned, but I have to add one more: Elvis Costello. He's in the top five lyricists of Cherdo-Land. Favorite albums: My Aim is True, Almost Blue, Spike. Have you ever given any of those a listen? As soon as 'ALISON' started getting airplay in L.A. I went right out and bought 'MY AIM IS TRUE', and I loved it, played the hellck out of it. He was just what we needed then, because I was getting tired of all that bombastic, formulaic "Arena Rock". Costello brought that sort of Punk/New Wave approach with him: Get in, say what you gotta say, and get out! As I recall, there's maybe only one song on that debut that makes it to the 3-minute mark and a couple that don't even get to the 2-minute mark. I bought the second album too, 'This Years Model', but didn't like it as much. And then my tastes started gravitating toward Blues (then Jazz) and I lost track of Costello and other Rockers (other than hearing an occasional song on the radio). I used to like saying that I was "just waiting for the end of the world". Funny you mentioned 'Almost Blue' because in his current BOTB installment, Arlee Bird used Alison Moyet and mentioned having used her before in a 3-way BOTB against Costello and Chet Baker on the song 'Almost Blue'. I told Arlee that in that earlier BOTB: "I was all prepared to vote for her until I heard the Chet Baker version, which stole the vote away from Alison. Chet's "aim was true". Well, I wish you WOULD join BOTB. Then Shecky Shady Shaft would stop gloating. He's been going around telling people, "I'm into something good... and Cherdo isn't!" You might have gone with Stevie Wonder for the win but this could still work out. Yessum, I remember Warren Zevon but I'm ashamed to admit that I didn't know him well enough to realize that he's dead. I enjoyed these vids, especially the collaboration with Springsteen and his performance clip of "Werevolves of London," a single that brushed the top 20 in the spring of 1978. I remember that hit, but the 10+ year difference in our ages is once again showing, manifested by a generation gap. You need to remember that, by the late 70s when you were just graduating from high school, I was already a single mother of seven and up to my ears in dirty diapers. I wasn't paying attention to popular music at the time. (The truth of the matter is I was deep into Disco and Kiss and wasn't focusing on some of the principal classic rock and folk rock artists of the period like Zevon, Springsteen, Paul Simon, Bob Seger and Meat Loaf. Now I'm paying the price because my knowledge of those artists is limited. It wasn't until the mid 80s when I moved to Florida, left the TV news business and got a job in entertainment production at that MTV station that I began to get more interested in rock artists. Knowing your taste in music pretty well by now, I would like to jump off topic and invite you to listen to a favorite of mine from 1985, my first year doing MTV. The artist is singer/songwriter Marshall Crenshaw performing "Little Wild One (No. 5)," a track from his Downtown album. I wish YouTube offered the official MTV video that promoted the single but I haven't been able to find it. I think the recording and the video were just about the coolest thing ever. I know you have oodles of time on your hands and therefore I urge you to listen to the song and let me know what you think of it. You get extra credit if you already know the song and bonus points if you dig it, too. There's plenty of Stevie Wonder on my playlist, but like I've said, I can't do 'em all! I loved his last album so much that I had to put Warren Zevon in this spot. I've actually seen Marshall Crenshaw in concert and you can probably guess that I love "Someday Someway." I'm giving myself half credit for "Little Wild One" because I knew it, saw him do it, and basically dig it - but I always wanted to speed up the tempo slightly and give it a better guitar riff. Something that would make it iconic. I do love that Detroit boy, nonetheless. I put Warren on "W" so I could save the "Z" for someone else. I'm tricky like that. Have a good day, Shadywolf of the Gulf! Werewolf in London is the only song I recognize of those. I'd heard his name over the years but I didn't realize that was his song! The first time I heard that song, I thought, "What did he just say? A what of where??" Thanks, Stephanie! I'll never tell on the ABFTS guys...mama needs her cartoonage. I don't remember this at all. You are doing such an incredible job of finding some long-lost performers and giving them credit for their creativity. All hail the creative! YOU are one of them, LK! Thanks for your kind words. He decided he was going to go out with a bang rather than a whimper. I'd like a book with just the lyrics - he is dark and hilarious, too. Not familiar with his music. Must give it a listen. This week at the Songster Grocery Store, I'm pushing "Keep Me in Your Heart." I love Poor, Poor Pitiful Me. It's practically my theme song. I can be pitiful when necessary. Really great biographical material and songs! Thank you, EPT - it's not as much as he deserves and it sure is hard to truncate it. I never knew that Warren Zevon was from Chicago, and that his dad worked for Mickey Cohen. He must have had quite an interesting childhood. It's sad that he died of cancer, but you have to admire him for living his final year on his terms. Werewolves of London is my favorite Warren Zevon song, but I'll check out the link to his last album. Thanks Cherdo! I remember hearing the news of his passing a few years ago on our classic rock station. I was so bummed! My dad is a musician and he played in bands all through the 70's. He respected Warren's work and had his vinyl albums. As a little girl I loved Werewolf of London. Now when it comes on radio, my husband always says You love this song and then turns it up. Great memories! Is it just me that was thinking Lawrence Welk? Ha! I'm just now being exposed to Zevon; give me time. I must say that you have some funny, funny readers. I enjoy your comment exchanges as much as the post!